If Kyoto is not at the top of your bucket list, it should be. The Japanese city is one of the rare destinations you can count on to constantly exceed the hype built up around it. Which is not surprising, what when you consider that walking its streets exposes you to more than a millennium of history, most of which saw Kyoto as Japan's imperial capital. As you'll see exploring the selections below, which have all earned mentions as the Top 10 things to do in Kyoto, the city is not so much a tourist trap as it is a tourist paradise, a place where you'll want to stay for far longer than your plane ticket allows. You might find yourself concerned as you walk the hill up to Kiyomizu-dera, an eighth-century Buddhist temple perched on a hill in the eastern reaches of Kyoto. It's extremely crowded here, rain or shine, sun or snow and at almost all hours of the day. Once you reach the main view point inside the temple, however, particularly if you happen to visit around sunset, you'll understand why this is among the best of Kyoto's top attractions, and is totally worth putting up with the throngs of tourists. Tip: While Kiyomizu-dera is beautiful 365 days a year, it's especially stunning under spring's cherry blossoms and autumn's brilliant colors. Would you believe that one of Japan's most picturesque bamboo forests sits within Kyoto's city limits? You will once you set foot in Arashiyama, which is less than half an hour from Kyoto station by train or bus. As an added bonus, you enter the forest through Tenryuji Temple, which provides an absolutely gorgeous gateway to the grove. 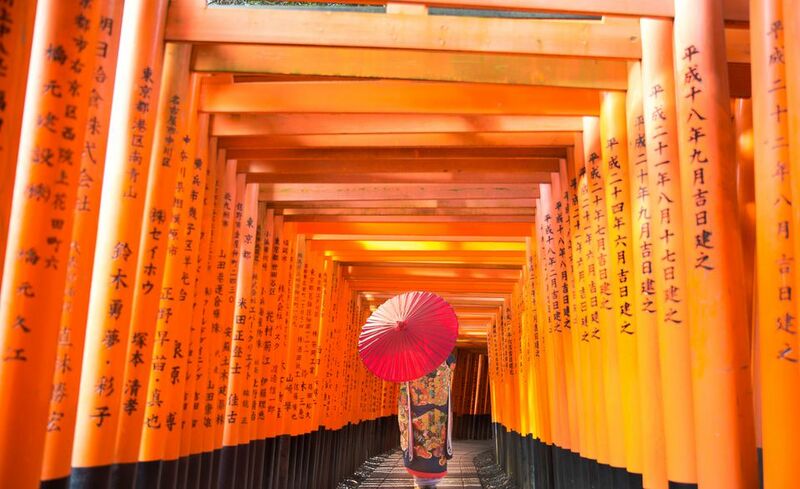 Another of Kyoto's most iconic images is of seemingly endless orange gates extending up the side of a mountain. This is the Fushimi Inari Shrine, whose path is actually less than two miles, just in case you're thinking to hike its entirely. Of course, if you're just on the hunt for the ultimate Kyoto selfie, you won't have to walk far from Inari station. After just a few minutes, in fact, you'll realize why this is one of Kyoto's top 10 attractions! While a gold-covered Zen temple has technically existed at the site of Kinkaku-ji since the mid-15th century, the one you see reflecting on the pond today actually dates back less than 100 years to 1955, when it was rebuilt after arson at the hands of a fanatic monk. Like most of Kyoto's top ten attractions, the aptly-named Golden Pavilion looks great no matter when you visit, although the white snows of winter seem to contrast best with its shiny exterior. Interestingly, the second-most famous Zen temple in Kyoto is called the Silver Pavilion (Ginkaku-ji), although it is not conspicuously silver in color. Although not as pretty as its golden sister, the Silver Pavilion sits at the beginning of the so-called Philosopher's Walk, which might just be Kyoto's prettiest stroll. If you head to the Silver Pavilion after lunch, you can walk the entirely of the path before sunset, potentially winding up at Kiyomizu-dera in time for sunset. Explore Kiyomizu-dera or nearby Gion, which boasts a few important selling points. First among these is the fact that Gion is the surest place in Kyoto to spot a geisha, although this title does come with a caveat: Geishas are still incredible rare to spot, and most of the ones you do won't want their pictures taken. Rather, you're much more likely to spot visitors from around Japan and neighboring countries dressed in geisha outfits. And let's face it: Some of them look convincing enough that your friends back home might not realize they're impostors! In spite of its important name and massive size, Kyoto Imperial Palace does not make it on to lists of Kyoto's top attractions as often as some of the other places you see above and below it. Yet it's a worthwhile addition to any Kyoto itinerary, both because it served as the residence of Japan's imperial family for more than 1,000 years, and because it sits right in the middle of many of the attractions you're going to see anyway. Most of the top ten attractions in Kyoto are ancient, which isn't a shock when you consider how much history the city has. With this being said, a trip to the top of Kyoto Tower is worth considering, if only because of the incredible panorama it offers. Even if you only manage to admire Kyoto Tower from afar (it looks great from the view point of Kiyomizu-dera!) it's impossible to miss from ground level in the city, on account of the fact that it towers 430 feet into the air—Kyoto's tallest structure, by a long shot. Like Kyoto Imperial Palace, Nijo Castle is the most unsung of Kyoto's top ten attractions, since it's not as selfie-worthy as Fushimi Inari Shrine or Arashiyma, nor as scenic as the Philosopher's Walk or Kiyomizu-dera. Yet Nijo Castle is as picturesque as it is historically important—it was built in the early 17th century to house the first Shogun of the Edo period (which, ironically, was what led to Japan's capital being moved to Tokyo). Like the Imperial Palace, Nijo Castle is also convenient enough that there's no reason you shouldn't visit it. As is the case with Kyoto Tower, Kyoto Station is among the most modern of the top ten attractions in Kyoto, with most of what remains of it having been built long after its 1877 inauguration. Even more surprising than the station's inclusion on this list, however, is the incredible perspective you get from its 15th floor, which reveals a building much more futuristic than you'd expect for the gateway to a largely ancient city like Kyoto.